Unique Design Villa With panoramic views of Protaras and Profitis Elias Church. Quiet location. Private Pool. Free Wi-Fi. A soul artistic cottage situated in a scenic, cul de sac, beneath the Saint Elias hill top church. The cottage is idyllic, for the perfect tranquil holiday home and only a 15 minute walk from the blue sea beach front and the heart of Protaras where you will discover restaurants and bars pubs and shops to suit all tastes and ages. The artistic water rock feature falls into a kidney shaped pool surrounded by exotic palm trees with a view of Protaras sea view and the Famagusta coastline. Relax and sunbathe by the pool in the sun or have a cool drink at the hand decorated by owner bar, in the shade. The cottage comprises two ground floor bedrooms with main bathroom and one master bedroom with en-suite shower on the first floor. The cottage is fully equipped with all modern kitchen and facilities, fully air-conditioned and free high speed Wi-Fi internet. For your romantic winter holidays, The hand crafted décor in the cosy lounge area is completed with a log fireplace decorated with a handmade sea shell mirror. 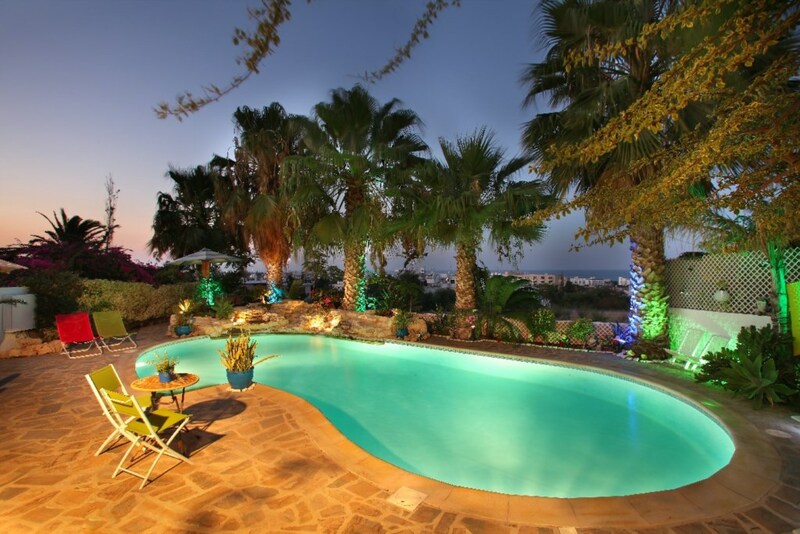 This unique 3 bedroom villa is located on Profitis Elias Hill with unobstructed sea views of Protaras and the Profitis Elias Church. Located in a quiet, very much sought after area just 5 minutes' drive or bicycle ride to the centre of Protaras and the best beaches in the area. Protaras, a more family oriented resort for children of all ages has features the best beaches of Cyprus, all crystal clear water and white sand, the most famous of which are Fig Tree Bay and Sunrise Beach. All the main beaches have a water-sports centre where you can enjoy water-ski, scuba diving, flyfish, windsurfing, SUP, sailing, deep sea fishing and just about every watersport you want.